I hope you and your families are having a wonderful holiday season. In light of the recent tragedies in the news, let’s treasure the precious time we have with the ones we love. I’ll be out of town visiting my own family for the next two weeks, so not performing my regular shows. Please take a look at the show schedule below to see when I’ll be resuming my regular gigs in January. (I’m leading a camp when I return, so some shows don’t resume till the 2nd or 3rd week of January.) Also, I’m leading several new afterschool classes in the new year. Find the details below and if you’re interested, register your school-aged child! – Mondays at Friendly House. Email me or see the attached form for registration details. 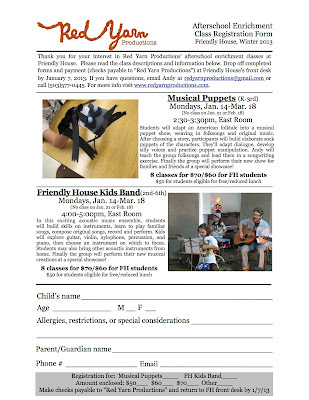 Students will adapt an American folktale into a musical puppet show, weaving in folksongs and original music. After choosing a story, participants will build elaborate sock puppets of the characters. They’ll adapt dialogue, develop voices and practice puppet manipulation. Andy will teach the group folksongs related to the tale. Finally the group will perform their new show for families and friends at a special showcase! In this exciting acoustic music ensemble, students will build skills on instruments, learn to play familiar songs, compose original songs, record and perform. Kids will explore guitar, violin, xylophone, percussion, and piano, then choose an instrument on which to focus. Students may also bring other acoustic instruments from home. Finally the group will perform their new musical creations at a special showcase! – Thursdays at KCLC/MLC school. Find their club guide and registration form here. Are you a fan of Glee, American Idol, or the awesome new music you hear on the radio? If so, join Red Yarn Productions for this one-of-a-kind club! Students will choose their favorite radio pop songs and develop choral arrangements. We’ll work out simple instrumentation with guitars, keyboards, percussion and a drum machine. Finally, the group will perform their songs for families and friends at the showcase! – Fridays at Bridlemile. Find registration details here. 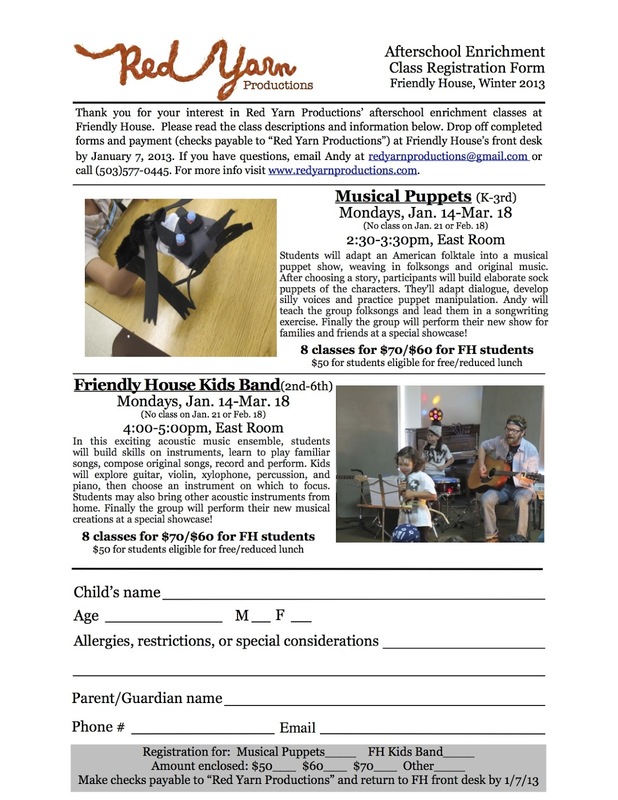 As always, keep Red Yarn & the Critters in mind for birthday parties, school residencies and performances. And show your support by“liking” Red Yarn on Facebook!